As identity theft, fraud, and data breaches become increasingly common, a similarly increasing number of businesses and individuals are coming to recognize the importance of shredding their sensitive documents and information. With the growing number of people turning to document shredding to protect from security risks however, new obstacles and questions now emerge, like for example what to do with the leftover shredded paper. Surprisingly, there are a variety of useful and environmentally-friendly ways to put previously-discarded paper back to work, and in some cases, they may be closer to home than one might think. Here, we take a closer look at a few ways shredded paper is used after it’s disposed, and how you can ensure you get the most out your papers throughout their lifecycle. With an increasing number of homes and businesses wondering what they can do with their paper after using a shredding service, it can be sometimes easy to forget how paper is a natural resource, and as a result has a variety of natural applications. In the most figurative sense, some of the greenest uses for shredded paper are in gardens. For example, by mixing equal parts of shredded paper and grass, this composted blend can be used and broken down by garden plants just like any other garden waste. Like with composting, shredded paper offers an effective replacement for traditional mulches. By spreading shreds around flowers and plants, shredded paper can help to suppress weed growth while at the same time helping to improve garden fertility. By using compost and mulches made from shredded paper, individuals can not only find an excellent source of nutrition for the garden, but also an excellent way to make disposing paper environmentally-friendly. When it comes to finding ways to reuse shredded paper, many run into trouble when they try to actually recycle their shredded paper at recycling facilities. Many general recycling facilities accept all types of recyclable waste, and because of the difficulties in sorting out small bits of shredded paper that get mixed in, oftentimes simply won’t accept shredded paper. There is, however, an alternative recycling option for those still seeking to do their part in reducing our carbon footprint. With third-party shredding companies, they deal specifically in paper waste, and because they produce large volumes of shredded paper that isn’t mixed with other waste they’re able to make recycling the shreds viable. Like other individuals and businesses who are recognizing the importance of environmental sustainability, many shredding services work with recycling facilities for exactly this purpose—helping to provide ways to protect both sensitive information and the environment with a document lifecycle that never ends. Paper shredding is the go-to strategy for homes and businesses who need to protect their sensitive information, and while security during destruction is always top priority, shredding services can also provide the benefit of environmentally-friendly uses for shredded paper. At Shred Nations, we work with a nationwide network of the top shredding providers, working to provide secure document destruction services for homes and businesses needing document destruction for projects both large and small. To learn more about shredding and recycling services or to get started finding a shredding provider to suit your needs, just give us a call today at (800) 747-3365, or simply fill out the form at the right of your screen to get free shredding quotes from local providers in your area. 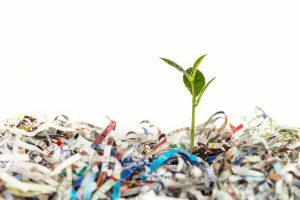 Although document shredding is an industry based around paper waste, this doesn’t mean the shredding industry can’t find ways to be environmentally-sustainable. 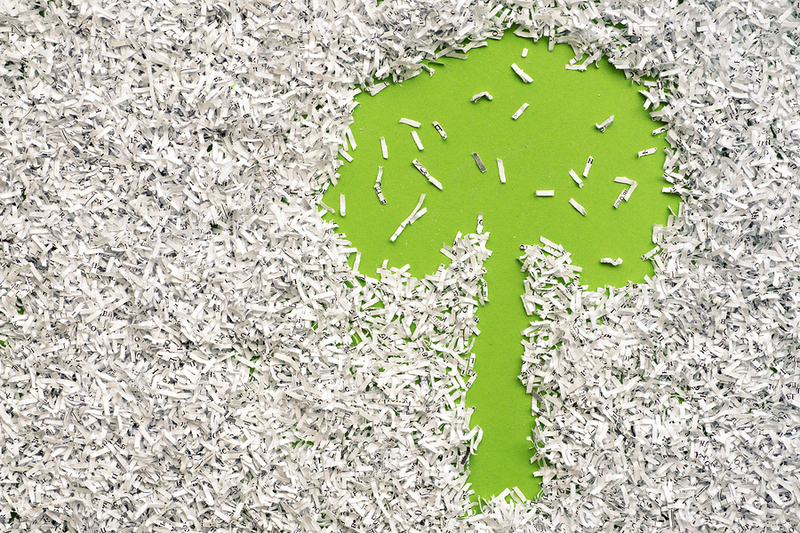 Learn more about how our shredding services work to reduce our carbon footprint while still helping to keep the sensitive information they contain protected in this in-depth white paper.